Wes spent today working the outage at Diablo Canyon, so I decided to try a matinee. 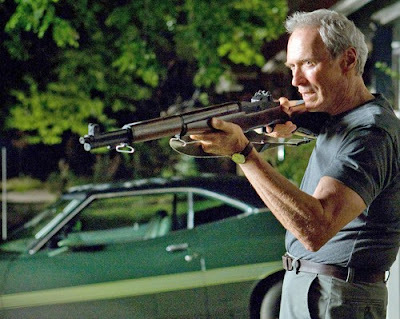 After looking through the paper, I settled on Gran Torino featuring Clint Eastwood. The movie opens with a funeral, Walt Kowalski's wife has died and we attend the service and wake with him. His two sons feel he is no longer able to care for himself and should consider taking up residence in an Active Senior Living facility. They feel he no longer lives in a safe neighborhood since it has become run down and filled with "Hmong people." He is no way interested in changing his way of life and ends up throwing his own children out of his house for even suggesting it. Troublein the neighborhood begins almost immediately after that. His garage is broken into and a "want to be" gang member tries to steal his Gran Torino as a gang initiation. Walt eventually ends of befriending this young hoodlum, his sister and their family saying he feels like they are "more like family than his own family." Gang members continue to try and force young Thao to join up or else and of course Walt ends up defending more than just himself and his home. The ending is everything you'd expect from a Clint Eastwood movie. I LOVED this movie. It was funny, sad, and filled with more racial slurs than I even knew existed! The slurs are made even more funny due to the fact that a "Polack" is the one saying them. Remember all those "How many Polacks does it take to.....?" from years ago? The acting of Clint Eastwood combined with relative newcomers, Bee Vang (Thao Lor), Ahney Her (Sue Lor) and Christopher Carley (Father Janovich) is very good. Having a Hero that is older, not in great shape and definitely not afraid to use force to achieve a more "positive" outcome is refreshing. He may despise "The Church" and call a lot of people names but you find yourself admiring the way he tries to defend others and their rights. I say, two thumbs up! You are definitely going to want to see this movie!